Heat oven to 400°F. Cook bacon until crisp; drain on paper towel. Crumble bacon; set aside. In 12-inch cast iron or ovenproof skillet, cook ground beef and onion over medium heat until beef is thoroughly cooked, stirring frequently. Drain. Place beef mixture in medium bowl; cover to keep warm. Add oil to same skillet. Heat over medium-high heat until hot. Add potatoes; cook 3 to 5 minutes or until browned, stirring constantly. Add cooked ground beef mixture, corn, chiles, barbecue sauce, cheese, salt and pepper; mix well. Cook until thoroughly heated, stirring occasionally. Sprinkle with bacon. Separate dough into 8 biscuits. Arrange biscuits over hot mixture. Bake at 400°F. 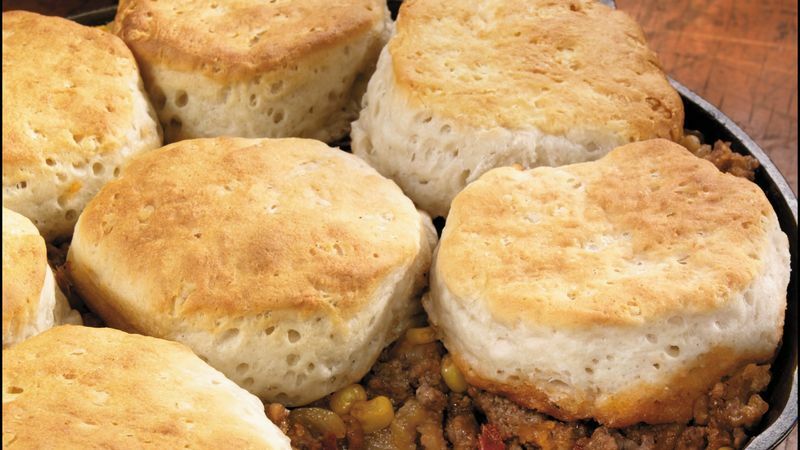 for 16 to 24 minutes or until biscuits are deep golden brown and bottoms are no longer doughy.